In fact, Augmented Reality enhances real world surroundings with computer generated digital content such as videos, animations, sounds and graphics. 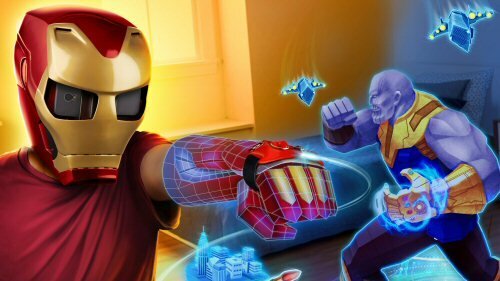 Nowadays, Ar games in the market are interactive, fun learning for preschoolers, kindergarten and elementary school children. Moreover, the applications are compatible with iOS and Android devices (smartphones and tablets) and they help kids to learn something valuable through an effective use of technology with minimal supervision of their parents and teachers. On the other hand, some of the AR applications help children to exercise too. AR encourages the user to move, which is great news for parents of small kids who are glued to the sofa. The 3D elements are in the user’s space and with good application design, therefore the user needs to move around to interact. Children love exploring things. Augmented Reality helps them answer their questions, learn and discover things about the world. And all that happens while “playing”. 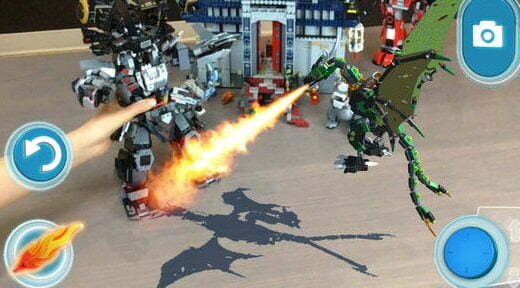 2-Finally, Lego city’s animated fire-breathing dragon comes alive in the company’s AR app. It is built using Apple’s AR Kit. You can watch Sebastian the crab bang on some real-life characters with Disney’s Dream Play set up. It transforms a physical object like the Merge Cube into a musical instrument or a galaxy-conquering spaceship. Obviously, It changes a simple, plastic toy gun into a laser tag machine with Merge’s 6DoF Blaster, which uses a smartphone to create digital targets that you can blast.